In the week following my last article, Tree Swallows, Gold Finches, White Throated Sparrows, Clay-coloured Sparrows and Harris’s Sparrows have finally arrived. In checking our past records, we found that most of these birds come here about the last week of April and not the second week of May as has happened this year. Oh well, better late than never. 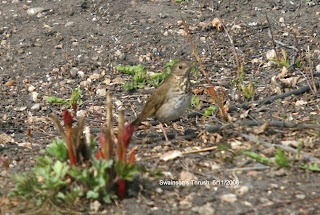 There is one more transient bird that I want to cover this spring – the Swainson’s Thrush. I feel that it is a good bird to feature, as it comes to our yard every spring without exception, and probably will in yours. Birders can be quite sure that they will be rewarded by the presence of a Swainson’s Thrush in their yards. The Swainson’s Thrush is closely related to the very familiar Robin. In fact, it has the same profile and behavior patterns as a Robin. Like a Robin, it spends a lot of time in gardens and lawns looking for worms. A freshly tilled garden is especially attractive to them (and to Robins). Perhaps the worms are brought to the top? A general description for purposes of identification is to look for a very large “sparrow” that behaves like a Robin. Some even describe it as a little brown Robin. A sure way to tell a thrush from a sparrow is to watch its movements when it is feeding on the ground. A sparrow hops as it darts from place to place; a thrush runs. In size, the Swainson’s Thrush is about halfway between a sparrow and Robin. The top of the head, back of the neck, wings and tail are a medium brown in colour; the back is olive brown; the breast and belly are whitish with the upper breast having a buff tinge to it. The upper breast is, also, covered with spotted streaks running more or less vertically. The buff colouring extends to the bird’s cheeks and thin eye rings. However, to see these buff features one almost needs binoculars. Its song has been described as a series of flute-like whistles. To me, it sounds vaguely like a Robin singing very softly and far away in a deep forest. The only common birds that it can be confused with are the various sparrows, but look for the distinctions described above. However, it does have two close cousins, the Grey Cheeked and Hermit Thrushes, which are very similar to it in all respects. The key distinction is that neither one has any buff colour on it – especially the eye ring. Only the Swainson’s Thrush has a buff eye ring. In other words, a little brown thrush without a buff eye ring is either the Grey Cheeked or Hermit Thrush. If one of the “other” ones has a rusty brown tail that is very noticeable in flight, it is a Hermit Thrush. All three are considered excellent songsters; all three sing with flute-like whistles. The Hermit Thrush’s song is considered the most beautiful of the bunch. There is one other thrush that is a close relative to the Swainson’s Thrush – the Veery. In our area it is a summer resident and not a transient. Because it needs larger stands of mature trees, it is very seldom seen in town. Of all of the little brown thrushes, the Veery, has very little or no striping on its breast, thus making it very easy to identify. I plan to do a piece on this bird in the future. Even though the last three are uncommon in town, they do occur. A keen eye might notice, and then identify, some of these species. There is nothing more satisfying to a birder than identifying an uncommon or rare species. This very cold, thus late, spring has definitely delayed the arrival of some species. Nevertheless, they are arriving, albeit slowly – bad weather or no bad weather! House sparrows have even started nesting. Some other birds, like the Mourning Dove, are pairing up for the nesting season. Even though one could hardly tell by the weather, spring is definitely here! Since the last article, a few more species of birds have arrived. White Crowned Sparrows are here and can be heard singing all over town, if one knows what to listen for. The song is a rather pleasing three part affair starting with two (usually) short whistles followed by two sets of trills. It is best to see the bird singing; then memorize the tune. It is not that hard as it is rather catchy. Close relatives of the Goldfinch, the Pine Siskins, are back in droves and are simply attacking our feeders. One can almost see the seed going down in the feeders. 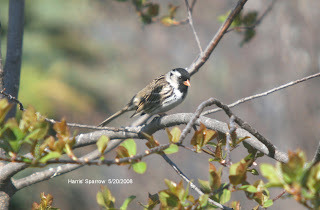 The Lincoln’s, White Throat and this week’s featured bird, the Harris’s sparrow, are not back as of this writing, but should be back by the time this goes to print. The Harris’s Sparrow, our largest sparrow, is a transient that stops here for a few weeks in the spring and fall as it flies to and from its nesting grounds in the Boreal Forest. It is easily identified by its black throat, face and top of head. From this black facial mask protrudes its pale pink beak. I always get the impression that it was shot, head on, by a black paint ball. Once seen, it cannot be mistaken for anything else. Like all sparrow, males and females are the same. Its song is a rather long drawn out whistle in one pitch, followed by another whistle in the same pitch. Then it will usually whistle again, but this time in a lower pitch. Peterson describes it as an “overall minor effect”. I hear it every spring in town, and even with my limited musical talents, I can recognize the whistles as being minor. Musicians should enjoy listening to, and for it. As striking as the Harris’s Sparrow is, it is still confused with other birds; sometimes while observed in the outdoors and sometimes from a bird book. One such bird is the House Sparrow. With its black bib, the House Sparrow does superficially resemble the Harris’s Sparrow, but the differences are readily noticeable. Similarly, the Harris’s Sparrow is confused with the Eurasian Tree Sparrow. The Tree and House Sparrows are closely related and very similar in appearance and habits. Even though both are introduced species, the Tree Sparrow has not spread far from the area of its original release near St. Louis in 1870. On the other hand the House sparrow has spread explosively across the Americas. As with most sparrows, the Harris’s Sparrow likes to scratch in leaf litter to expose food. It is often seen in mixed flocks of White Throated, White Crowned and Lincoln’s Sparrows along with Pine Siskins and Goldfinches. The interesting thing to note is that the Harris’s Sparrow does not hesitate to bully other birds smaller than itself. 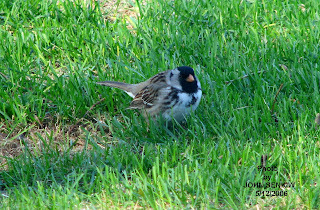 Along with other sparrows the handsome Harris’s Sparrow is almost certain to be in your back yard. Listen for it; look for it. You should not be disappointed.